France is a country associated with luxury, fashion and rich historical events. Same holds true for the history of French coin making that goes back all the way to the mid 14th century when the first French gold coins francs were minted. The very first batch of gold francs was embellished by an image of French King John fully armored and riding a horse. 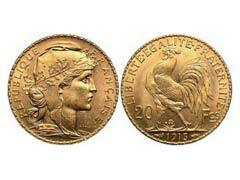 Some of the other old French gold coins that could be found on the market today are livres and ecus. When buying especially old coins, make sure they come with the certificate of authenticity and are assessed by professional numismatic specialists from the major coin grading agencies. Acquiring French certified gold coins will ensure you are getting the real deal and not gold plated fakes. France was also known to produce sample coins that displayed the splendor of mintage industry of the old times called Monnaie de Luxe. These French gold coins were not intended to be circulated but were produced for pure display reasons. These were one of the first European gold bullion coins that hold both incredible gold and numismatic value. However, among all French gold coins the most popular ones that are routinely purchased by numismatists all over the world are Napoleon gold coins. Napoleon Bonaparte coinage wore a profile of his image in seven different variations. Napoleon Bonaparte coins were initially struck in the year of 1803 and were thought to represent the finest examples of European minting industry of that time. These were so wide spread that they were minted not only by French minting courts but courts in Netherlands, Italy and even England. Today Napoleons are some of the most traded pieces among old French coins combining high quality numismatic product and relatively low premiums. As to modern French coins, France has been issuing a great deal of commemoratives in proof grades that could be suitable for both collectors and investors. Should you consider buying French or any other old gold coins over eBay Internet auction, be advised to exercise caution and verify sellers’ feedback before placing bids. This will ensure your eBay gold coins are what they claim to be. Despite the historical value and rarity factors of old time French coins, these do not enjoy the same liquidity as other counterparts minted in other countries and present more interest to coin collectors rather than investors.